The Dalles and Hood River campuses will close at 5 pm today (2/4/2019). Any class that started at 5 pm or later will NOT meet. Online classes are still meeting unless otherwise directed by the instructor. Tomorrow, 2/5/2019, both campuses will be on a two-hour delay. Classes scheduled prior to 10:00 am will NOT meet, talk with your instructor about any missed work. Online classes are still meeting unless otherwise directed by the instructor. Both campuses are closed starting at 5 pm (2/4/2019), all classes and events are cancelled. Tomorrow, 2/5/2019, both campuses will open at 10 am. Classes scheduled prior to 10:00 am will not meet. 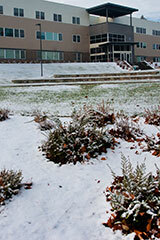 Campus offices will open at 10:00 am.